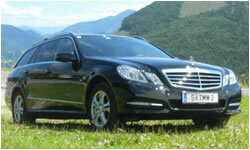 Looking for the perfect limousine for your special occasion in or around Salzburg, Austria? › Or just a night out on the town? Then we have a perfect limo for you! Hire a TMW limousine and relax in luxury and style while you are chauffeured to your destination. Our best educated drivers will do anything for your well-beeing. Just tell him your wishes an he will do what ever is possible. Our rates are available hourly, daily or weekly. Please feel free to contact us.